After writing a very long article on Mobile Banking in Nigeria and Africa as a whole. 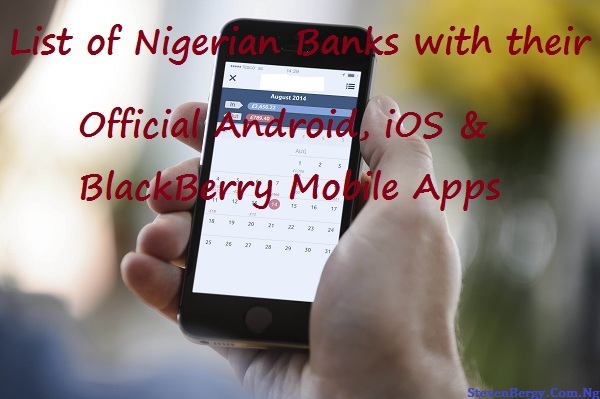 I decided to bring you a list of Nigerian Banks with their official Mobile Banking Apps so you can download the App of your financial institution on your Smartphone. If you've not read the last article on Mobile Banking, you should read it here -> Mobile Banking <-. Now, I present to you the list of Nigerian Banks with their official Mobile Banking Apps. Note that if you did not see your Bank's App on this list then that means your Bank does not have a Mobile Banking App yet, you can check back for further updates. Kudos to those Banks that have their Apps present on all the three major Mobile platforms. Hope this list helps ! Do you have any update or contribution to make ? You can drop your contributions through the comment box and don't forget to share this useful post with others. Cheers !! !